For the first time in Washington (and maybe the whole country! ), a carbon tax is going before a state legislative body for a full vote. This is a big deal and we need your help! Our sources tell us this vote is likely to be sometime tomorrow (Wednesday) and it will be on the Governor’s carbon tax proposal (SB 5127). To be upfront, we don’t think this bill is likely to pass tomorrow in this version. It looks like the Senate leadership is putting various tax concepts up for a vote to gauge their popularity in the lead up to the serious education funding negotiations. Our take on SB 5127 is that while it could be improved (especially with a low income rebate and by fixing the Transalta coal loophole), it’s a reasonably good starting point for negotiations or amendments and we like that the $25 per ton rate resembles I-732. We want to see SB 5127 garner as many yes votes as possible tomorrow so that carbon taxes in general have a better chance of making it into the final budget negotiations. You can help RIGHT NOW by calling or emailing your State Senator. Look up your Senator’s email or phone number and leave them a message telling them taxing carbon pollution is the best school funding solution! If you need some talking points, feel free to work off of this script and adapt it however you like. Just make sure to call or email by tomorrow morning! Once you’ve called your Senator, call the Senators in neighboring districts OR recruit your friends to call, too. A word of optimism: In large part due to our efforts the last two years, there are three different carbon tax proposals in play right now. Multiple legislators have even written us to say that the carbon tax idea is very much still alive. It might be a 3-point shot, but every now and then one of those shots goes in! 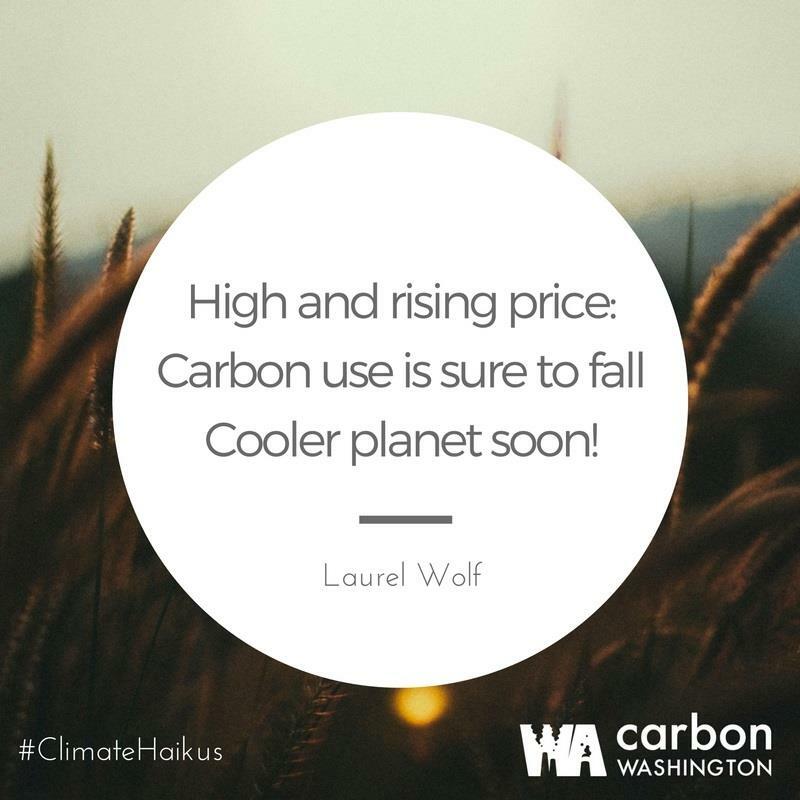 Get inspired by the Haiku above from former staffer Laurel Wolf and get on the phone!